We started our road season in style, with two wins from three races at the Outdoor Traders winter series at Dalton Barracks on Saturday in miserable conditions. Read about Tamaras great ride down below. 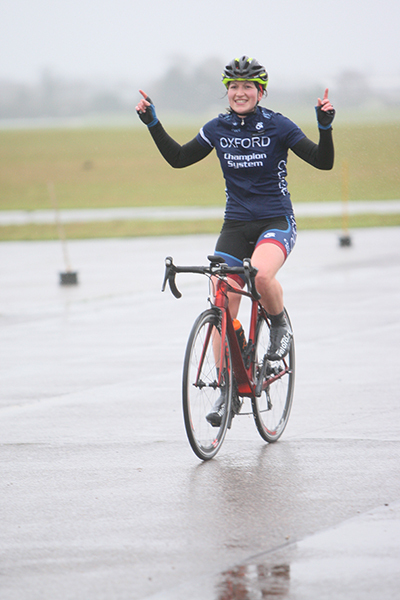 Abingdon Airfield crit series Women 2/3/4 – race report from Tamara D.
It was a wet start with a very strong wind. I quickly realised not many people were willing to push or were strong enough to lead the pack in the headwind section. I always feel like increasing the pace of the pack is a good thing to make it hard for everyone, but you donâ€™t want to be the idiot who is spending all her energy/time in the front (â€˜Strong like a bull, smart like a tractorâ€™ â€“ thatâ€™s what Chris used to say!). So I started to try not being in the front, but even in the tailwind section the pace was not that fast â€“ I guess in the first 5 minutes the adrenaline kicks in and everything feels almost â€œtoo easyâ€. Thatâ€™s when my mate Tracy (from my team Zappiâ€™s women RT) came in the front of the pack and suggested that I attack. It was 8 minutes into the race, it took me only few seconds to go for it , my instinct decided for me and before I realised my legs where pushing really hard, I looked back and I had a gap! Most of the time I have a rule during the race, which will be wait until half of the race at least before attacking, because if you are on your own, you will struggle to maintain more than 30 minutes at a TT pace, especially with such a strong wind. The reality is: OPPORTUNITY, itâ€™s a crit race and nothing goes according to plan and I am really pleased Tracy pushed me to do it â€“ thatâ€™s the power of having a mate who believes in your potential more than you do yourself. After the headwind section (half a lap) my gap was decent, no one in the bunch was willing to chase/waste energy in the front of the bunch. This head wind section every lap killed me , whereas I would normally fly with a massive tailwind on the other section, I could only average 38km/h, recovering from the effort on the headwind section. I have never raced in such strong wind! Towards the end I saw a green helmet not too far behind me, I had the feeling it was one of the girls â€“ but hard to see without my glasses, the exhaustion and the rain. I kept a close eye on her and kept turning around. I had a 20â€ gap on her for the last 3 laps, she was obviously very strong to get away and chase me but I held on. Thatâ€™s it, itâ€™s the last lap â€“ I struggled to reach 40km/h in the last section, put my hands in the air to cross the line and I proudly showed my colours. It’s a good start to the season, two months to go before our main BUCS TTs and Varsity! We had 4 others OUCC riders who braved the rain & wind, 3 in the 4th cat race (Cason, Angus & Matt) and 1 in the men 2/3/4 race (Isaac). Matt took the win for his first race: what a good start! Well done everyone, it was good to see blue jersey out there! There are 3 more races in the series. Dalton Crit, the main memory I have is that I have never been so cold and wet, the weather was absolutely miserable. The course was about 1km straight into a headwind, 1km straight tailwind, and 300-400m of a very brutal crosswind. Just as the race started the rain picked up so it was horizontal driving rain, I couldnâ€™t believe I was racing in this, really missing the gentle racing in Australia! On the first lap I decided to attack from the gun into the headwind, not the smartest place to go but needed to warm up a bit after standing on the start line. Two riders bridged up and weÂ started working well but was quickly reminded that this was the first race of the year, the legs just couldnâ€™t hold the pace so I went back to the bunch then the others were caught pretty quickly. Into the headwind was hard trying to find any shelter, and constant surging and weaving as people tried to find a spot out of the wind. As soon as we came around into the tailwind the pace went up massively, and everyone was working pretty much equally due to the wind so no rest there. It was a shock how hard it is to put power down while going fast again, been a while since Iâ€™ve done that in a pack. Then back into the crosswind where had to lean the bike right over to keep going in a straight line. A few laps some splits occurred but fortunately I wasnâ€™t caught out behind anything too big. I was sitting in, preserving the legs for the finish, which did make me a bit colder but not too much. Just as I thought Iâ€™m glad Iâ€™m still working hard and not standing by the road I felt a flat tyre on my rear wheels, which lead to lots of swearing. From there walked back to the HQ, which was about 1km, in the rain and cold. Was shivering uncontrollably by the time I got there, and immediately had warm tea, soup, bacon sandwich, put on all my clothes but was still freezing, stood there shivering for about an hour chatting to other people. Â Once got going again on the ride home I warmed up and was fine. Overall very interesting day on the bike, a bit disappointed about not being there for the finish, but hopefully a good long season ahead for OUCC!